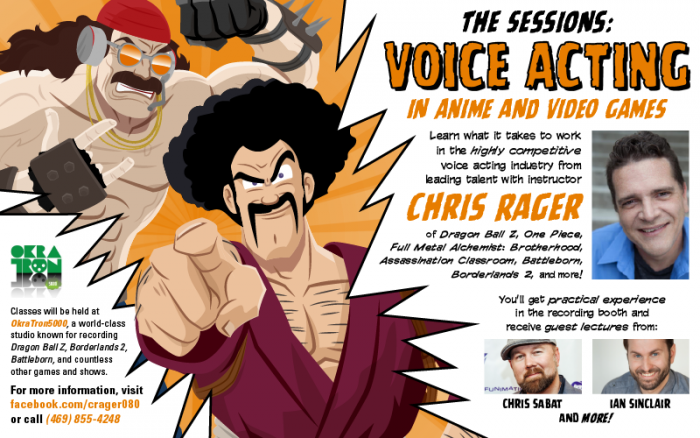 This flyer design (including the illustrations, obviously) was a quick freelance project created for Chris Rager, the (English dub) voice of Hercule in Dragon Ball Z and Torgue in Borderlands 2 — a.k.a. the two characters shown here, if you’re unfamiliar with them. He’s starting up a class on voice acting next month and wanted something eye-catching to help promote it. I don’t know any more details, so just read the flyer! If nothing else, I thought you guys might like the illustration. This entry was posted on Thursday, February 11th, 2016 at 11:09am	and is filed under Drawings, Etc..